In the Bitbucket team, we believe containerization is the future of continuous integration and deployment. Running your software in containers brings consistency and predictability all the way from your development environment, through your CI/CD pipeline out to production. To help smooth the path for container-based development, I wanted to reflect back on a set of improvements we’ve made to Docker support in Pipelines over the past few months, which bring speed and new capabilities to your build process. 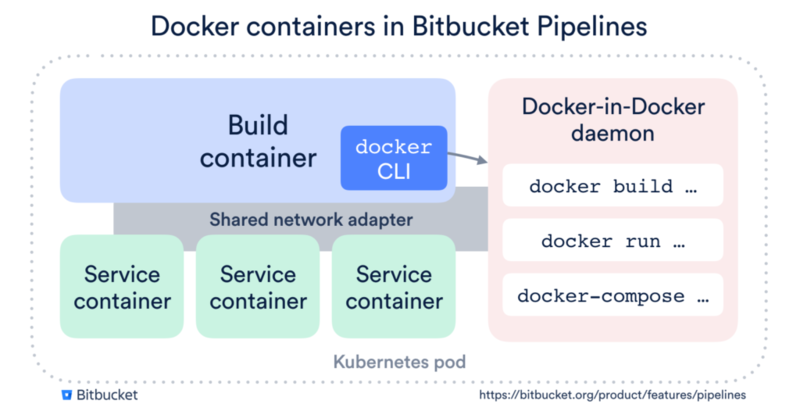 With these improvements, Bitbucket Pipelines is now the leading choice for building and shipping Docker-enabled applications in the cloud. Your build environment is a Docker image. No pre-baked VMs with slow startup and six-month-old dependencies. As soon as a new release of your favorite platform hits Docker Hub, you can use it in Pipelines. The services your build uses (databases, etc) are just Docker images. They share a network interface with your build container, so you don’t even need to worry about port mapping. Built-in support for Docker build, tag and push. Just enable it in your build, and we’ll run a Docker-in-Docker daemon and provide the docker command-line tool so it works out of the box. But this is just the beginning with Pipelines. From this solid foundation, we’ve been able to layer on some great features that will make your Docker builds even faster and more powerful. Image caching will automatically apply to all public Docker Hub images used in your build. Layer caching will include all images and intermediate layers used by the Docker-in-Docker daemon that powers your Docker builds on Pipelines. Enable this by adding the docker cache to your Pipelines steps, as shown below. Among customers who have enabled Docker layer caching, we’ve seen 80% of repositories shave off more than 30% of their uncached build time – and almost half (49%) have cut more than 50% off their uncached build time. These dramatic reductions will save real time in your team’s daily feedback loop. Large builds support allows you to allocate a total of 8GB of memory to your build (up from 4GB). Double memory costs you double the build minutes, so we recommend using it only where you need it. Configurable memory for services allows you to specify how you want to this memory allocated. We require 1 GB for your build image and our overheads, so the 7GB remainder can be allocated to service containers or to your own Docker containers. If you’re using Docker heavily, you probably have a bunch of docker-compose YAML files to kick off your application in a variety of configurations. With the Docker-in-Docker daemon in Pipelines, you can now use docker-compose to spin up your entire application for testing. Below is an example of using docker-compose with a 7GB memory allocation to spin up a set of services and test them out. Note that this example has a few extra commands to install the mysql client and docker-compose binaries that aren’t necessary in a real build scenario, where you would bake your dependencies into a custom Docker image for your build environment. This example uses this docker-compose.yml, and wait-for-container.sh – a small shell script to poll the Docker health check and wait for a container to start. If you want a better look at how this docker-compose example fits together, check out the docker branch in my demo repository. If your team is big into Docker, you now have a list of great reasons to try out Bitbucket for your next project. Try Bitbucket today, and enjoy the benefits of a CI/CD solution purpose-built for Docker. Bringing you speed, power and flexibility with 12 new features in Bitbucket Pipelines.